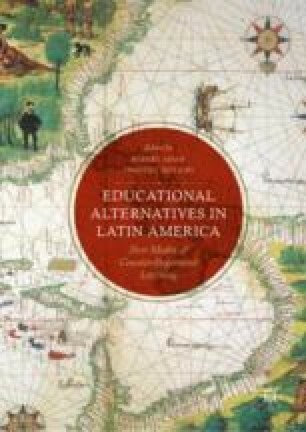 This chapter narrates the potentials and challenges on the thresholds between a paradigm of market-based, formal education in deep crisis and an emerging paradigm of eco-cultural community-based ‘formation,’ in the geopolitical context of the current industrialization of the Brazilian Amazon. Through eight interwoven short stories about young artist-coordinators of the Community University of the Rivers, it evokes the inter-subjective pedagogical culture of independent, multiple interventions within high school and federal university education. Framed within post-colonial, self-decolonizing experiences of ‘indifferent’ fatalism about the future, accelerating disintegration of ‘the social’, and unprecedented experimentation with sexual identity, lived on the banks of the River Tocantins about to be irreversibly transformed into a river highway and vast hydroelectric dam, this afro-indigenous pedagogical drama acquires a compelling global relevance.